Our state-of-the-art commercial salons give our hair and beauty students the opportunity to try out their new skills on paying customers, all under the supervision of our expert staff. 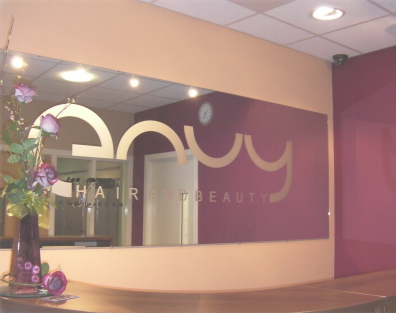 Both Envy Salons based at SGS Filton, and SGS Stroud offer a range of treatments, from nail extensions, tanning and hair styling to waxing, massage and facials, all using industry-recognised product ranges. SGS students can visit our salons to take advantage of the latest hair and beauty treatments at competitive prices. Had a brilliant experience at Envy. Great advice given in helping me choose which colour to go for following my bleach disaster. My hair was rescued by the lovely Kelsey and Leigh, for a 1/4 of the price of high street salons, thank you so much. I can go out in public again. I'm already booked in for my next appointment. Excellent service. Felt really relaxed and my skin is looking great! I enjoyed my haircut! My hairstyler did a great job in trimming and thining my hair, and constantly checked with me. :) thanks for her patience with me! The stylist listened to what I wanted, made a good decision about what should be done, and made a great job of my hair. She was considerate, polite and she took her tutor’s advice really well. I’m very happy with the result - Thankyou! The girl I had was brilliant sorry I can’t remember her name . She explained everything . Very professional the time went so fast . I had a great experience and Lulah completely sorted out my hair. She gave great advice; my hair is so soft and shiny now. Thank you! A nice and clean salon with a professional and vibrant atmosphere. A complete bargain too- would definitely recommend!! Amazing service and very friendly staff. She did and amazing job of my hair and it feels so soft and healthy. Thank you! I have been quite a few times now for these facials. Each time I have been pleased with the results and found the students to be professional, I must also mention the tutors . They are very dedicated to the students, My family have noticed the difference in my skin, as I have myself. Keep up the good work. My experience was delightful and was pleased with results. One thing that could be improved -was the that the beautician could have applied more pressure when filing and dealing with cuticles. Perhaps it should be that they request the client advise when it maybe too much pressure then the beautician can start to realise what is best going forward. Hope you understand this comment.